In October 2018 I was invited to join a committee established by the UCI Esports Arena to address the need to create more inclusive and comprehensive guidelines and code of conducts for use by the arena. This partnership has been very fruitful. Not only have we begun reshaping of the existing code of conduct and creating guidelines for streaming and social media use associated with the arena, we have also partnered with UCI CARE (Campus Assault Resources and Education) to create bystander intervention training unique to the arena and online gaming situations. I am also happy to announce that myself and another colleague, Matthew Knutson (PhD candidate in Visual Studies), have been invited to present on the work of the committee as part of the inaugural Esports Day programming at GDC (Game Developers Conference). 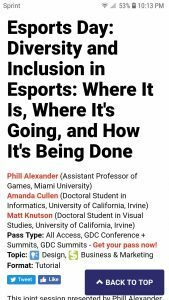 We look forward to presenting on our process and working with other experts and advocates to continue to create more inclusive spaces in esports. 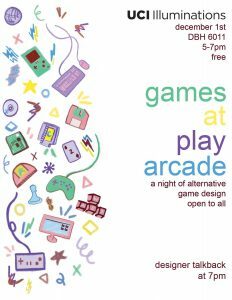 On December 1st, 2018 myself and another member of the CATS Lab, Kathryn Brewster, hosted an event that we organized which we called the Games @ Play Arcade. 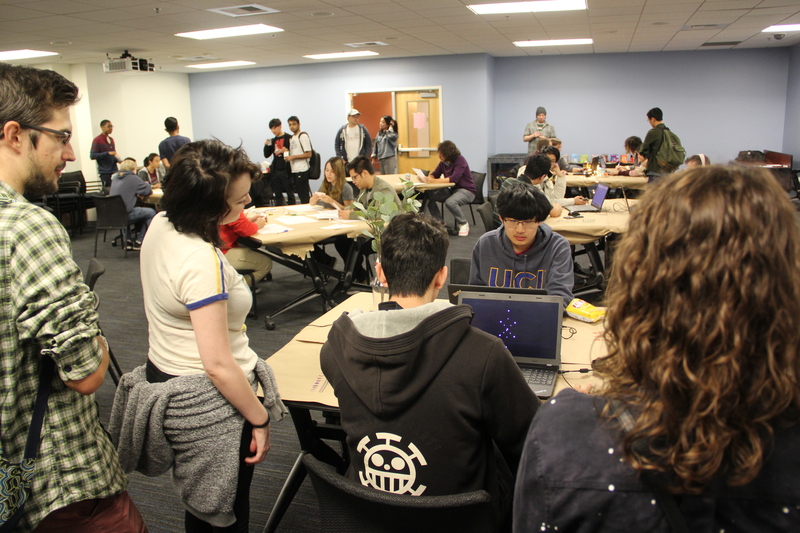 We conceived of it as an arcade to introduce the UCI campus to experimental independent games, a domain that often goes overlooked on a campus so focused on esports and partnerships with AAA studios. We put out a small call online inviting submissions. We received over 60 submissions which we narrowed down to 10 to showcase in the arcade. 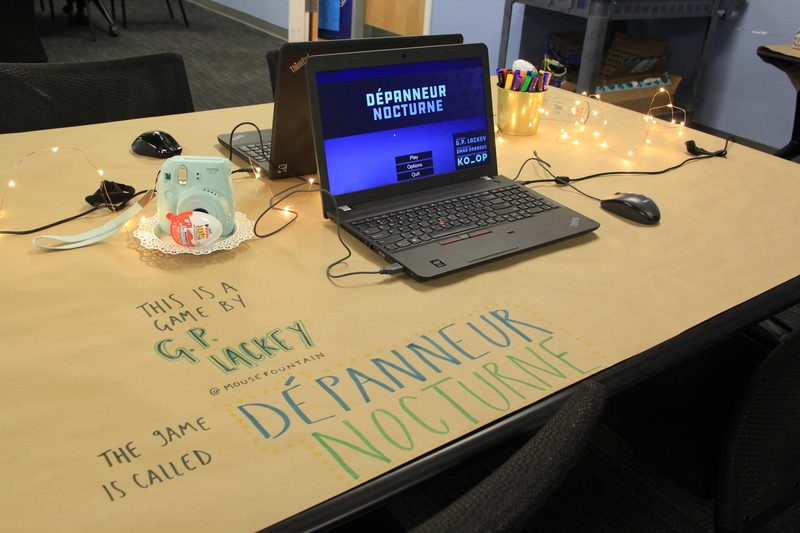 Thanks to funding from a UCI Illuminations grant we were able to pay an honorarium to every developer whose game was selected! Each developer (7 digital, 3 analog) sent demos of their games and we set them up for play in a one-night only arcade! We had nearly 80 attendees- pretty good for Saturday night on a college campus- and we look forward to organizing a similar event next year. Above is a few choice photos from the arcade and below is a link to a thread on my Twitter where you can read descriptions of all the games featured in the arcade. The UCI Diversity and Inclusion in Esports Task Force has published a report in the latest issue of the International Journal of Gaming and Computer-Mediated Simulations. The task force, of which I am a member, is chaired by Dr. Constance Steinkuehler and includes individuals from several offices and departments on the campus who are committed to ensuring a welcoming and safe environment for all UCI students interested in esports. The report outlines UCI’s plan to ensure diversity and inclusion in esports on campus, addressing topics such as player recruitment and training as well as campus oriented community programming around competitive gaming. The report also addresses several other initiatives we plan to implement in the future. We hope that this document will prove helpful to advocates for collegiate esports on other campuses as well. I have published a piece of writing in Feminist Media Studies for a special issue on women in sports. My contribution is a thought piece on the pressures of postfeminism and failure on women interested in competing in esports, using Overwatch‘s Geguri as a case study. Geguri is an amazing athlete whose career I have followed with great interest. I enjoyed writing this piece immensely and I hope to both publish on this topic further and incorporate it into my dissertation. Cowritten with my fellow UCI CATS lab member, Spencer Ruelos, I have published a thought piece on the need for increased communication between the disciplines of anthropology and game studies. The piece was published on Platypus, the peer-reviewed blog run by CASTAC (Commitee for the Anthropology of Science, Technology, and Computing) that is affliated with the American Anthropological Association. I want to thank editor Evan Conaway (PhD Candidate, UC Irvine) for inviting the contribution. A piece that I worked on with Kate Ringland and Chris Wolf was published this week on First Person Scholar. Kate has been an enthusiastic supporter of my Overwatch research since I came to UCI. 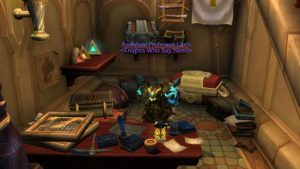 When Symmetra’s autism became part of the canon lore we both saw it as a great opportunity for another collaboration, an intersection on my work in Overwatch and her work with autism in gaming (her dissertation is on the Autcraft server in Minecraft). Chris stepped in because she’s an awesome researcher who was willing to lend us her expert outside perspective. And her superlative writing and editing skills. We were limited to approximately 2000 words in the FPS piece, but we are hoping to publish a more comprehensive and nuanced take on disability representation in Overwatch in the future. In the Winter 2018 quarter I was enrolled in a wonderful course “Ethnographies of Technology” with Dr. Valerie Olson in the UCI Anthropology Department. Each participant in the class was asked to select a book that they considered to be an interesting example of an ethnography of technology published in the last decade. And instead of writing a final seminar paper, Valerie tasked us with writing an academic book review. I selected This is Why We Can’t Have Nice Things: Mapping the Relationship between Online Trolling and Mainstream Culture by Whitney Phillips. Some of the research I’m currently conducting is examining identity work in game communities, particularly practices of identity exclusion that punish outsiders, such as harassment. My review of the text, as well as reviews of other ethnographies of tech, can be found on the Techno_ethno website run by Valerie. I co-authored a paper with a couple of my colleagues from the STAR (Social and Technological Action Research Group) lab. The paper presents a meta-analysis of research examining visibility of disability in order to contribute to discussions about how perceptions surrounding disability can be probed through an examination of visibility and how these tensions do, and perhaps should, influence assistive technology design and research. I contributed as third author by providing my perspective based in queer studies and anthropological literature and drawing from my experiences researching marginalized populations. 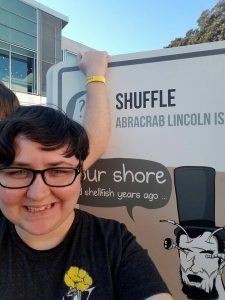 This year I attended the 10th annual IndieCade, thanks to the generosity of my advisor Dr. Bo Ruberg and Stephanie Barish, founder of IndieCade. IndieCade showcases the work of hundreds of independent game developers every year in order to cultivate innovation and artistry in games, and is the largest and best known games festival for indie games. The giant version of Exploding Kittens. 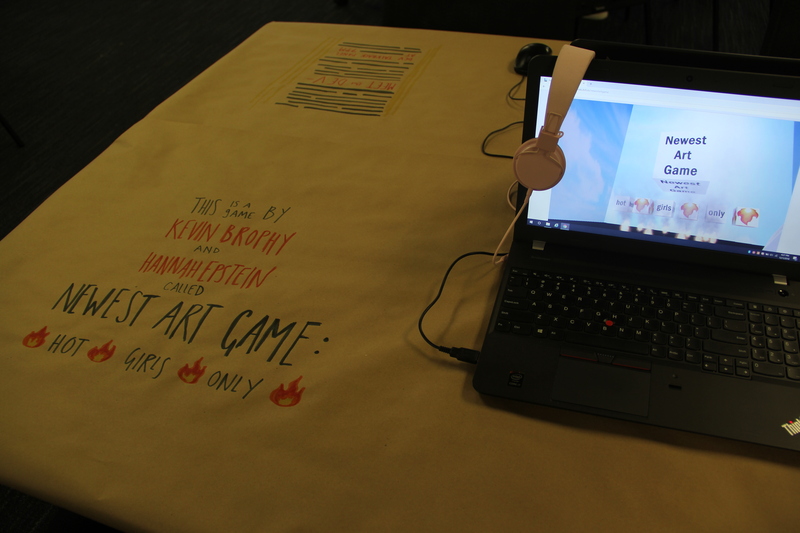 Exploding Kittens got its start at IndieCade and this year was a sponsor. Sign, a tabletop game from Thorny Games about the experience of creating your own form of communication in order to be understood. 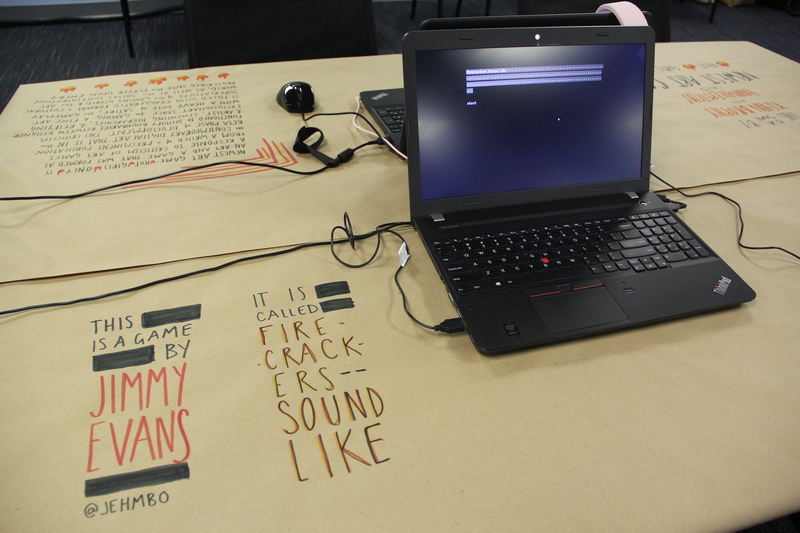 Oblige, a narrative side-scroller game from students at USC about a working class mother in 1979 Hong Kong. It had a really interesting mechanic incorporated into the typing that altered the experience in a way that really underscored the message in the game. Anamorphine, a surreal first-person exploration game that visualizes feelings. Somewhere in the South, a survival horror experience which takes place on the Underground Railroad. And of course, Magia Transformo, which was made here at UCI by members of the Transformative Play Lab. MT is a physical game about witches that utilizes movement and digital augmentations in costumes to create the experience of doing magic. 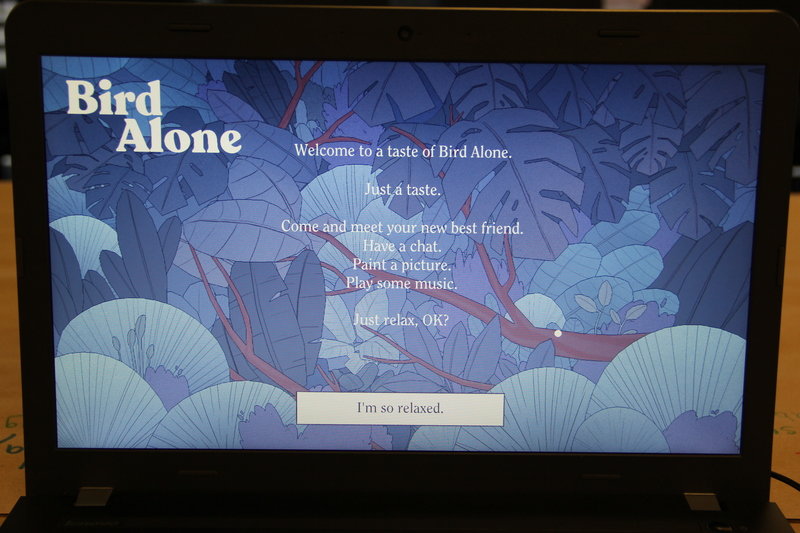 IndieCade is a fun and fulfilling experience for any person with an interest in independent games. 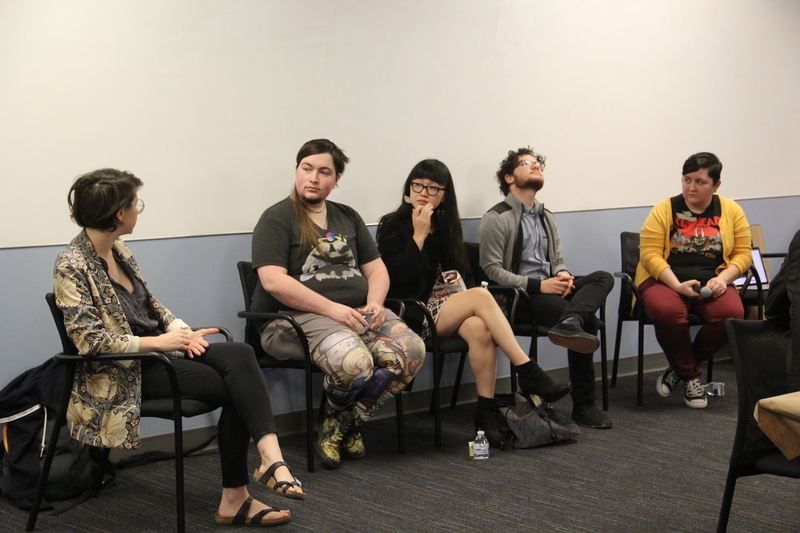 It also a venue for scholars and developers to discuss issues related to independent game making, and so IndieCade includes a number of interesting and informative panels. 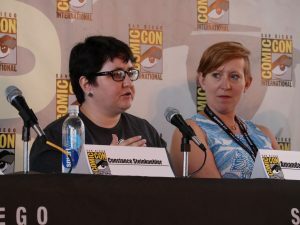 I had a great time at San Diego Comic Con talking about my Overwatch research and my experiences as a PhD student researching player experiences and video games, which are now a huge aspect of our popular culture here in the United States. Thank you to the GeekEd organizers for inviting me, and thank you to those who were in attendance for their excellent questions and comments.